The AABANY Advocate is Looking for Writers! 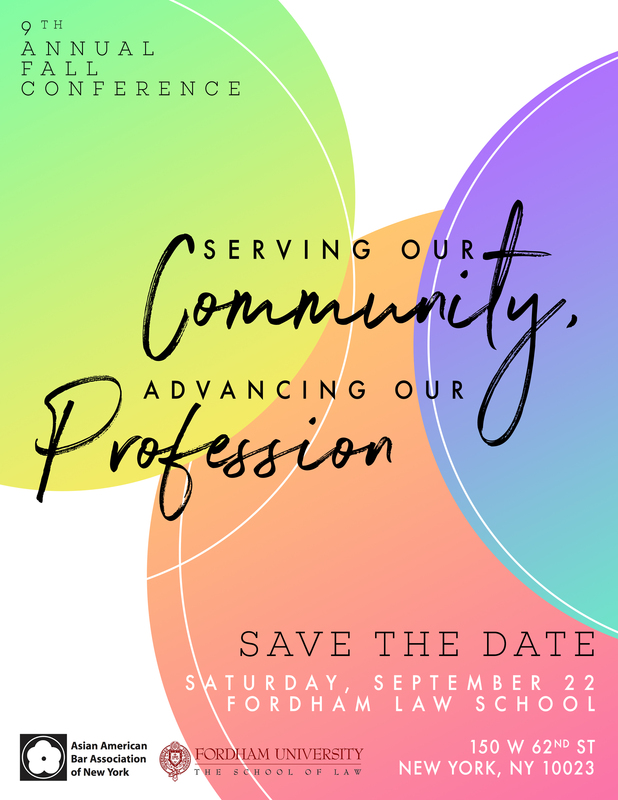 The Fall Conference is taking place on Saturday, September 22, at Fordham Law School. We will be taking program submissions this year via Google Form. We invite submissions from AABANY Committees, AABANY members, and our sister bar associations. The deadline to submit the form is May 31, 2018. The Ninth Annual AABANY Fall Conference will take place at Fordham Law School on Saturday, Sept. 22. More details to come but in the meantime we ask that you save the date and make plans to join us for yet another full day of great programming and activities. We are very excited to announce that our inaugural AABANY Leadership Development Program (ALDP) has launched, thanks to the efforts of Board Directors Marianne Chow Newman and Sapna Palla. The first meeting with our inaugural class of participants took place on April 20, at Wiggin and Dana. In its inaugural year, ALDP will present a 6-8 month pilot program that is specifically focused on guiding a selected group of qualified senior APA law firm associates who have completed basic leadership training and who have a strong desire to become a partner at his or her law firm, through the law firm partnership process. We are looking for staff writers to take on the important issues affecting the AABANY community through serious journalism, research, and writing. Do you think that you have what it takes? Writers will be tasked with covering events of interest, researching developments in the legal field, and addressing issues that affect our communities on a generally quarterly basis. Writers are expected to cover assignments as well as develop their own topics and articles under guidance from the editorial staff. Those interested should email Albert Suh at [email protected] with a brief introduction or statement of interest and a short writing sample. Secondary Traumatic Stress is the emotional duress that results when individuals hear about the firsthand trauma experiences of another. Many immigration attorneys, especially in the non-profit sector, may often experience secondary traumatic stress when working with clients who have faced and/or are currently facing trauma. This is especially true for attorneys who work with clients to obtain humanitarian immigration relief including T-visas (trafficking), U-visas (crimes), SIJS (for young people who were abused, neglected, and abandoned by a parent), asylum, and VAWA (domestic violence) as many of these reliefs require the telling and retelling of the clients' stories. The next joint committee meeting for AABANY's Government Service and Public Interest/Pro Bono Committees will be on Wednesday, May 2, 2018. At the meeting, we would like to share and discuss potential upcoming events for the program year. We welcome your thoughts and input on this year's programming. They have expressed a strong interest in meeting with stakeholder, patent attorneys, and others interested in IP services. One primary focus will be on patents and a discussion of Singapore as a hub of IP in South Asia. As background, IPOS recently became an International Search Authority for PCT One primary focus will be on patents and a discussion of Singapore as a hub of IP in South Asia. As background, IPOS recently became an International Search Authority for PCT applications and is looking to inform US Applicants of its capabilities. For example, although they are a new substantive office, they have recently hired experienced examiners from other countries. The annual kick-off meeting for the In-House Counsel Committee will be held on May 3 from 6:00 to 8:30 p.m. hosted by Mayer Brown. The IHC Committee will be planning the events for the fiscal year, so your participation would be greatly appreciated. For more information and to register, click here. MuBANY and FINRA invite you to attend a free panel discussion on how to become a neutral. This event is intended to raise awareness about the various opportunities available to practicing attorneys in the area of alternative dispute resolution, and promote diversity in existing neutral rosters. Whether you're currently in private practice and interested in expanding your repertoire, thinking about becoming a career neutral, or just looking to earn some extra income on the side, our esteemed panelists (see flier below) will be offering a range of perspectives on how attorneys may incorporate ADR into their practices. Join the AABANY LGBT Committee for a group discussion of LGBT Asian/South Asian attorneys on “Being Out and API at Work” in the legal community. Attendees can share their experiences and challenges with others at law firms, in-house corporate counsel, public interest organizations, and government practices. Please join Asia Society and Asian American Bar Association of New York for a special gathering to mark Asian Pacific American Heritage Month, when we will hear an array of moving personal stories and firsthand accounts of journeys to America. “Here To Stay” will present both the human impact of the modern immigrant journey, the tensions of the current moment, as well as an understanding of how these individuals are contributing to enrich the fabric of American life - just as so many have before. Personal stories will be followed by a moderated panel of experts to discuss the context of the immigration debate today. When buying online, select the “Non-Member Adult” ticket, proceed to the next screen, enter the code “AABANY” and the $12 ticket will change to an $8 ticket. Proceed to checkout. If you prefer to call Box Office or come to the Front desk, mention the coupon code when purchasing. Please join us on May 17, 2018 to hear our distinguished General Counsel panelists from AIG, Bank of America, Bristol-Myers Squibb, Visa, Newell Brands, and Carter’s discuss perspectives from the office of the General Counsel and issues surrounding diversity & inclusion. Prior to the panel, we will be hosting a cocktail reception where you can meet and network with other in-house counsel. To register, go to http://www.aabany.org/events/event_details.asp?legacy=1&id=1079512. Attendance is limited to in-house counsel. On February 19, 1942, President Franklin D. Roosevelt issued Executive Order 9066, uprooting some 120,000 Japanese-Americans – two-thirds of them American citizens – from their homes on the West Coast and forcing them into concentration camps. Fred Korematsu refused to go. He was arrested, and convicted of violating the Executive Order and related military proclamations. He appealed his conviction first to the Ninth Circuit and then to the Supreme Court. In 1944, the Supreme Court affirmed his conviction, upholding the Executive Order. In 1983, nearly forty years later, the federal court in San Francisco vacated Korematsu’s conviction after evidence was uncovered showing that the government had suppressed evidence that undermined its assertions before the Supreme Court. AABANY’s Issues Committee is pleased to invite you to join the newly formed AABANY Community Response Task Force! The Community Response Task Force (CRTF) is AABANY’s answer to the rapidly changing legal landscape and the need for quick, effective, and coordinated responses to the emergent issues that affect our communities. AABANY is firmly committed to being a strong voice and steadfast advocate on behalf of the Asian-American/Pacific-Islander community. In the past several months, we have all been witness to sweeping changes that necessitated powerful legal responses. While there have been some great triumphs, there were often times when it was difficult to obtain information, to find ways to contribute, or to organize a response quickly enough to be effective. The CRTF is specifically designed to address these needs. The CRTF will serve as a central clearinghouse for information and coordination – tailoring the alerts sent to each volunteer based on that volunteer’s preferences and the needs of the community. Alerts and actions will range from emergency legal services to direct non-legal service actions and from workshops to rallies. Did you clerk for a judge? Have you served as a court attorney? If so, please fill out our AABANY law clerk/court attorney survey! The New York City Bar Association is offering discounted membership to AABANY members. They will waive your one-time admission fee and give you 20% off your first membership dues payment. Membership dues are dependent on your earliest year of admission in any state or country. Click here to take advantage of this great deal. Interested in future speaking opportunities? Join the confidential AABANY Speakers Bureau if you're open to raising your profile and sharing your expertise. Click here to access the form. AABANY regularly receives requests from AABANY Committee Chairs and other bar associations for speakers to speak on various legal topics. This form is designed to collect information from our membership and engage those who are most interested in sharing their knowledge and expertise with various legal audiences. We respect your privacy. All information disclosed will be treated with the utmost confidentiality. Email [email protected] if you have any questions. Interested in moving your legal career forward? Launched at the 2013 Fall Conference, the Career Placement Committee seeks to match qualified AABANY members with available legal positions. The Career Placement Committee Intake Form is now available. Click here to help us help you. Feel free to also email your resumes and CVs to [email protected]. All information disclosed will be treated with the utmost confidentiality. If you have any questions or comments, please contact the Career Placement Committee at [email protected]. Judge seeks volunteer attorneys/law grads with experience in criminal, landlord-tenant or consumer debt matters. Judge presides on appellate cases and also handles some civil Supreme Court matters. Full-time or four days per week preferred, but flexible schedule can be arranged. A wonderful learning and mentee opportunity, as well as an excellent resume-enhancer. Although not guaranteed, many of former volunteers have moved onto paying legal positions. Opportunity to enhance research/writing and oral skills. Willing to fill out paperwork for paid fellowships, if necessary. Rolling deadline. Opportunities open year round. Applications are now being accepted for AABANY’s 2017 Legal Internship Program. Open to college students, law students and law grads, AABANY is looking for a few talented, energetic and motivated interns to help plan and organize AABANY programs and events, provide research and administrative assistance and perform other tasks and assignments to advance and promote AABANY’s mission. Applications are being accepted on a rolling basis. For full details and information on how to apply go to bit.ly/Lgl_Intrn_Details. Please direct any questions to Executive Director Yang Chen at [email protected]. Fellowship announcements can be found on AABANY's website under Career Center, in the sub-menu item "Fellowships." To see current announcements for Fellowships, click here. May 1: AABANY Tax Club Dinner. For more information, click here. May 1: AABANY presents: Secondary Traumatic Stress - Working with Clients With Trauma. For more information, click here. May 2: AABANY Co-sponsors: Meet IP Delegates from Singapore IP Office. For more information, click here. May 2: Joint GSPI/Pro Bono Committee Meeting. For more information, click here. May 3: In-House Counsel Committee Meeting. For more information, click here. May 3: AABANY Co-Sponsors: Diversity in ADR: How to Become a Neutral. For more information, click here. May 7: AABANY Presents: Being Out and API at Work, an APA Heritage Month Roundtable Discussion. For more information, click here. 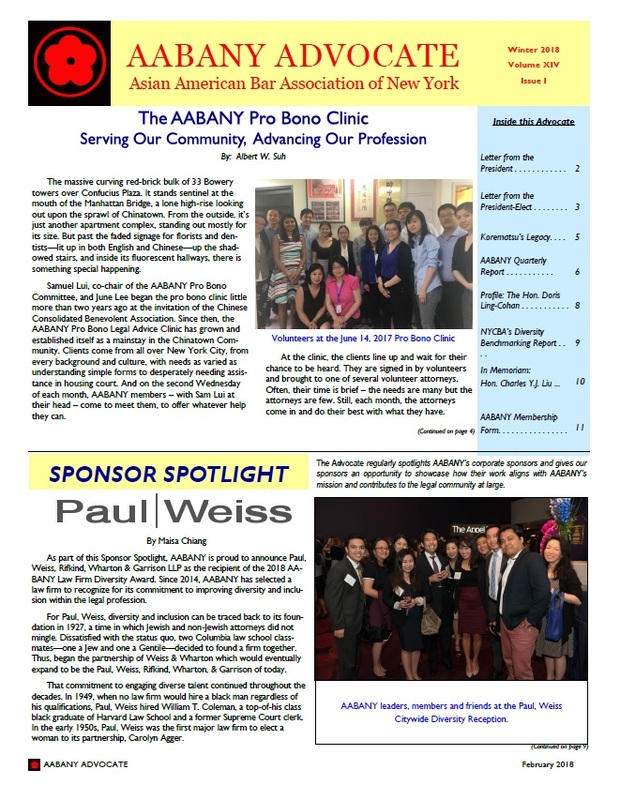 May 15: AABANY co-sponsors: Here to Stay: The Asian-American Immigrant Experience. For more information, click here. June 1: SAVE THE DATE: 21st Annual Gala of the Asian Pacific American Lawyers Association of New Jersey. For more information, click here. For more information on these listings and other open positions go to the AABANY Career Center. Members must be signed in to have access to the Career Center. Either search by keyword or just hit "Search" at the bottom of the form to see a complete listing of jobs. For past weekly announcements, see the archives page.